This stone is a multi-shade of green that resembles moss or trees from a distance. It is sometimes found with bands of brown agate and when this occurs it is called mocha stone. Moss agates are considered the most powerful of the agates. It was the agate of warriors. Moss agate is the most powerful of the agates that helps balance emotional energy. It helps the user to let go of anger and bitterness, so the emotions are balanced. It is an excellent stone to use in the business world. The night before an important business meeting cover a moss agate with marigold petals in a small bowl or cup. In the morning put the moss agate in your right pocket and be a success at the meeting. 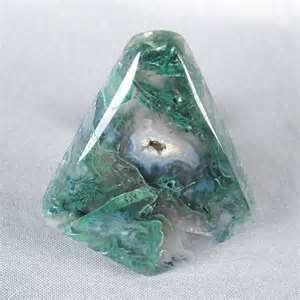 When used in jewelry the moss agate is believed to bring the wearer health, friends and riches. Moss agate enhances concentration, persistence, endurance and success in one’s endeavors. It is considered to be a stone of new beginnings and abundance. Due to its association with nature, Moss Agate fosters feelings of expansion, freedom and space, the same feelings you experience when you go for a walk along streams or the beach. The metaphysical properties of moss agate are primarily its strong connection with nature. Moss agate is a stabilizing stone that is said to refresh the soul and reveal the beauty of nature all around one. Healers use it to reduce sensitivity to weather as well as pollution in the environment. Due to its markings, which suggest moss, the moss agate is the especial gardener’s talisman. It is worn to lend energy to the depleted and for healing purposes. Moss Agate strengthens in times of stress. Midwives use it to assist in successful birthing. It is used to speed up recovery, counteract long term illnesses, cleanse the circulatory and elimination systems, reduce skin infections and relieve depression. Moss Agate relieves exhaustion and heals problems with the neck and back, blood sugar, anorexia/food issues, lymph nodes. Helps with breathing disorders. 4th (Heart) Chakra & 6th (Third Eye) Chakra.